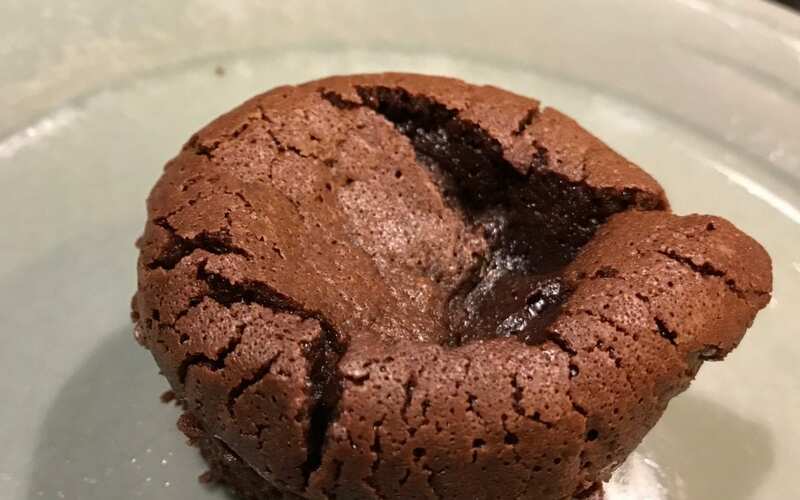 I made gluten-free molten chocolate cupcake this weekend. The recipe calls for wheat, but I substituted gluten free flour instead. It was absolutely delicious! Place butter and chocolate in a mixing bowl and place over a pot of simmering boiling water on low heat. Don’t let the bowl touch the boiling water otherwise; you will cook the chocolate instead of melting it. Stir constantly. Remove from heat when chocolate is almost completely melted and let sit for 10 minutes to cool. Have a hand or standing mixer ready, to mix the chocolate mixture–add one egg at a time to the chocolate mixture, sugar, vanilla, and salt and beat until well blended. Add flour and mix until just combined. Allow mixture to sit for 10 minutes, before baking. Or cover bowl with plastic wrap and transfer to refrigerator until ready to bake cupcakes and bake within 48 hours. Bake until batter puffs but center is not set, 8 to 10 minutes. I baked for 11 mins. Remove from oven and let cool for about 5-10 minutes, As cupcakes cool the center will collapse. Carefully lift cakes from cupcake pan, pull foil cups away from cakes and transfer cakes to dessert plates and garnish with raspberries and ice cream. Any uneaten cupcake can be stored in a container in the refrigerator, remove tin foil and then reheat for 10-12 seconds in the microwave to soften chocolate. About the writer – Helen Chin Lui is a Certified Reflexologist, Certified Energy Medicine and Reiki Practitioner. She is the founder and owner of the HealingPlaceMedfield.com and HealingPlaceEnergySchool.com. She specializes in helping adults and children to find long-lasting relief from chronic pain, digestive issues and heal hormonal imbalances naturally. If you would like to schedule a FREE 60-minute consultation to learn how Reflexology, Chakra Balancing, Energy Medicine, and Reiki can help you to find long last relief call (508) 359-6463.